Art as Usual: Mini Art Quilts: Whoo- Hoo! I actually got to see a proof of the Sew Somerset article yesterday as well. This will be the second time I've had an article published and it is still such a huge thrill. Maybe there are artists out there that can go on creating with absolutely no validation that their work is meaningful or interesting to someone other than themselves- but I am definitely NOT one of them. I love all your comments, especially the ones that are constructive. They really help me to thrive and grow in my work. Before I started on Etsy I was really reluctant to show my work to anyone. In fact, the few people I did show were pretty ho-hum in their reaction to my wire work. They loved my paintings, my drawing, but the fabric and wire thing just wasn't doing it for them. But here's where obsession can be a positive thing- I didn't care. I loved what I was doing so much that I just kept on doing it. Finally filling the entire house with my work- which then led me to Etsy (I had to clear the house out somehow). :) I don't know if I could have kept on as long as I have though without someone else saying they liked it too. Fortunately, the Etsy community of buyers and sellers have been incredibly supportive. They let me know that THEY liked it too and that has really kept me motivated to continue on creating and innovating. That and my husband has been incredibly supportive this entire time- totally important! So thank you! 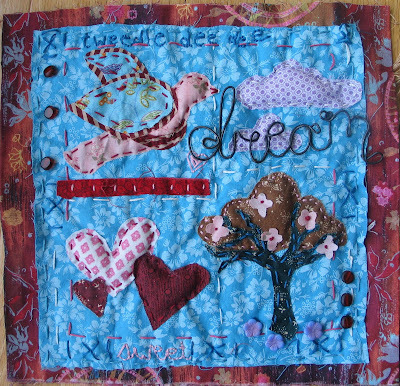 And as a sneak preview and to kind of celebrate I thought I would post one of the mini art quilts that will be featured in the June issue. "dream" was created as a collaboration with my four year old son. I sectioned the piece off into 4 boxes and cut out a bird for the first section. Then I asked Jasper what should go in the others. And of course what he says goes.... And that is how this quilt was designed. After the major images were in place I was looking for a way to embellish the quilt. It seemed to need just a little more "something" to make it complete. So rummaging around in my bag I found a wire "dream" I had created for an ornament that was just perfect! I added the tweedle dee dee at the top because Jasper had been watching The Backyardigan's Tale of the Mighty Knights a lot and the "tweedle dee dee" of the flying fairy song was constantly running through the back of my mind. My own little soundtrack for this piece. So those are a few of the little "behind the scenes" details of the construction of this quilt. I hope you enjoy it! I love it! And I think it is so beautiful that your boy inspires you and influences your work. Nothing could be sweeter...it's so cool that you follow your passion, and that you do what you love! it shows in the specialness of your work! Thanks to you both for your comments!!! They make me smile!!! !